SW Testing Services Ltd offer COSHH / LEV examination on systems used for the control of dusts, vapours, fumes and mists. The results of the tests must be kept for a minimum of 5 years. As part of our service we will send our experienced technicians to site to carry out a COSHH LEV examination on your system and produce a full report in accordance with the latest guidelines as set out in HSG258. The tests will consist of both qualitative and quantitative assessments. A requirement of HSG258 is ‘competence’. This means people having the appropriate knowledge, capabilities and experience to carry out the examination and testing. Our examination engineers are qualified to BOHS P601 or P604 Initial Appraisal and Thorough Examination and Testing of Local Exhaust Ventilation Systems which is recognised by the HSE as a competence qualification. In our report we will inform you of any recommendations required to repair, improve or upgrade your present system(s). Our reports are comprehensive and self explanatory, something which many clients struggle with, particularly when your system is tested through an insurance company. 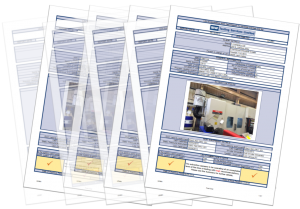 Our reports are a minimum of 7 pages for each system. We can issue your reports in both paper and electronic format. We offer either a one off test or a very competitive three test contract. For a free, no obligation quotation for LEV testing, fill out the information below.